This post in the Huffington Post caught out attention this morning. 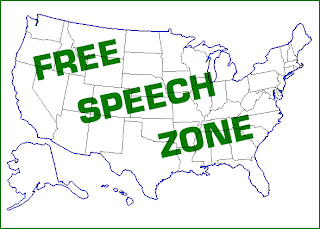 Included in the list of the "12 Worst Schools for Free Speech in 2012" is the University of Cincinnati, which has a "free speech zone" that limits “all demonstrations, pickets, and rallies” to a free speech zone that takes up just 0.1% of its campus. 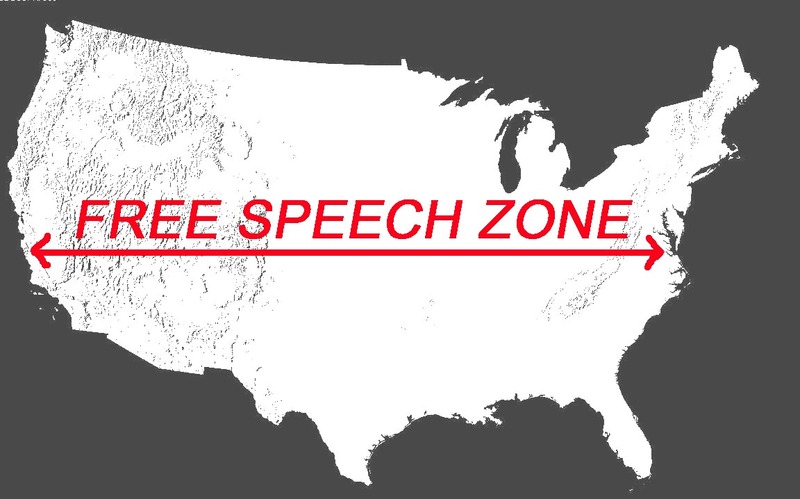 We haven't written about FREE SPEECH ZONES here, which clearly deserve a place in the Arsenal of Exclusion. The First Amendment to the United States Constitution states that "Congress shall make no law . . . abridging the freedom of speech . . . or the right of the people peaceably to assemble." Something like a “free speech zone,” or a special area set aside for the practice of free speech, would therefore be unnecessary, would it not? If one existed, would free speech therefore be prohibited outside it? If so, wouldn’t this violate the First Amendment? 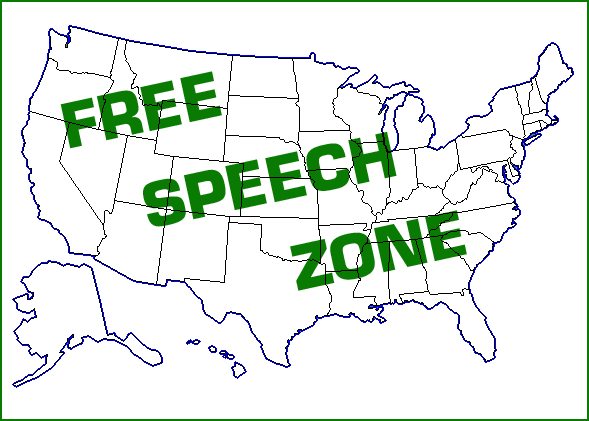 As Orwellian as it sounds, free speech zones not only exist, but are used regularly to control political dissent. 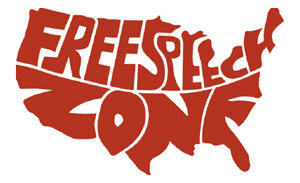 Colleges instituted free speech zones during the Vietnam-era protests of the 1960s and 1970s, but according to The National Lawyers Guild, a “pattern of behavior that stifles First Amendment rights” emerged from 1999’s World Trade Organization meeting in Seattle. Subsequently, throughout the 2000s, free speech zones were a regular presence at national conventions, presidential debates, war demonstrations, and pretty much any public appearance of George W. Bush. 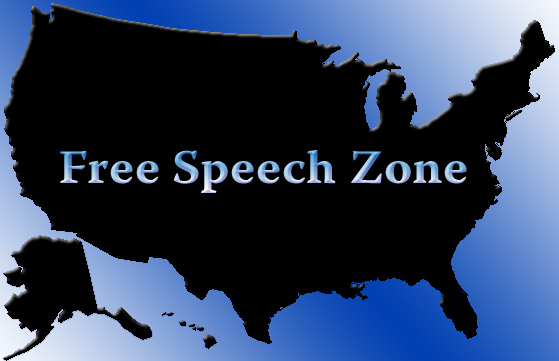 Groups like the ACLU have challenged the constitutionality of free speech zones, but a lot of criticism has been aimed at the free speech zones themselves, which, in most cases, have been too small, too harsh, and too out of the way. 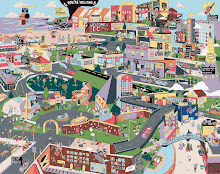 Most famous was the free speech zone designated for the 2004 Democratic National Convention in Boston. Enclosed by jersey barriers, barbed wire, and a chain link fence, and separated from the convention by service roads, train tracks, and a parking lot, it became known as the “protest pen” or “the cage.” A Judge who visited it before the convention commented that "One cannot conceive of other elements put in place to make a space more of an affront to the idea of free expression than the designated demonstration zone."